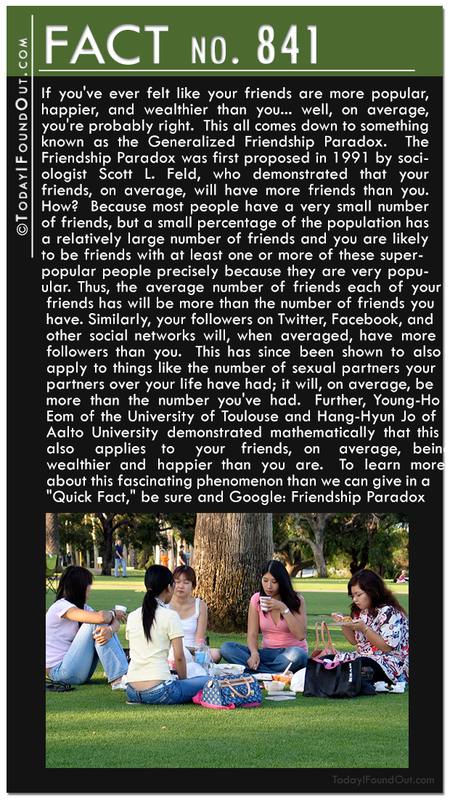 Quick Fact 842: The Friendship Paradox mentioned in Quick Fact 841 has many other implications as well, and has also inspired research in other areas. 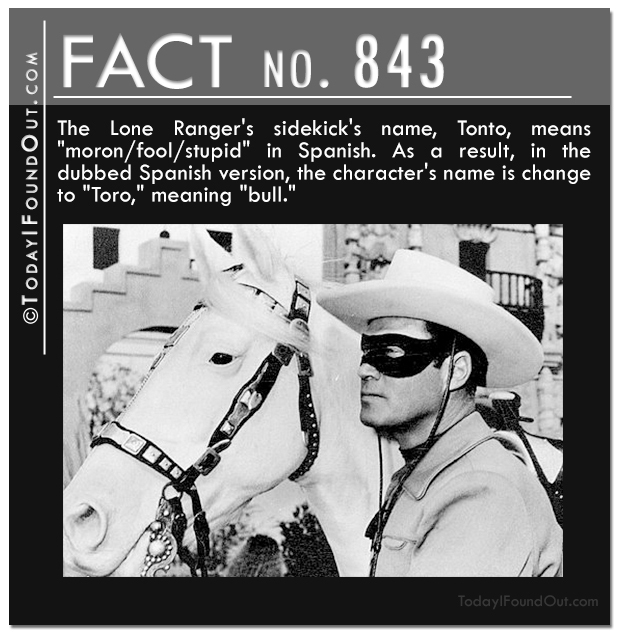 For instance, Dr. Nicholas Christakis of Harvard and Dr. James Fowler of the University of California, San Diego, inspired by the Friendship Paradox, decided to do a study, Social Network Sensors for Early Detection of Contagious Outbreaks, where they contacted 319 random Harvard students and asked them to name some friends. This resulted in many friends listing the same friends and a very nice friendship tree at Harvard. They then found the more central nodes on that tree (the most popular students, that they named the “friends” group) tended to get sick from the Flu about 2 weeks before the average of the members of the other group that they called the “random student group.” Further, this “friends group,” also on average, got sick a full 46 days before the Flu epidemic peak. 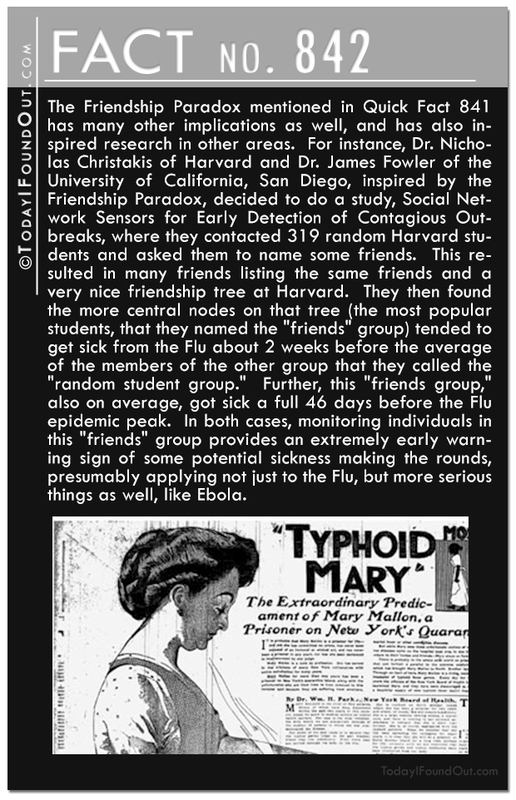 In both cases, monitoring individuals in this “friends” group provides an extremely early warning sign of some potential sickness making the rounds, presumably applying not just to the Flu, but more serious things as well, like Ebola. 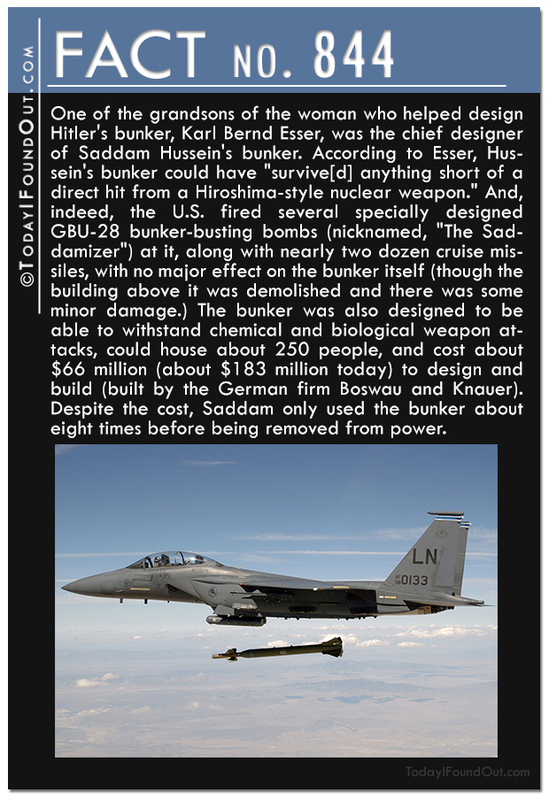 Quick Fact 844: One of the grandsons of the woman who helped design Hitler’s bunker, Karl Bernd Esser, was the chief designer of Saddam Hussein’s bunker. 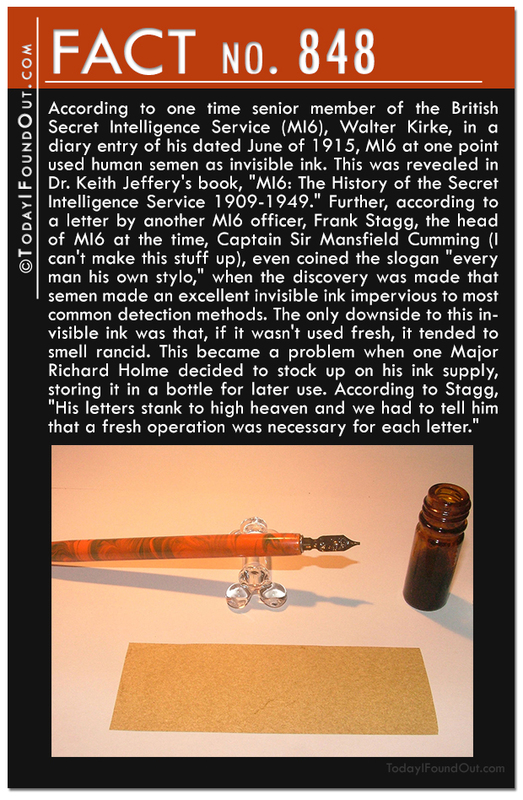 According to Esser, Hussein’s bunker could have “survive[d] anything short of a direct hit from a Hiroshima-style nuclear weapon.” And, indeed, the U.S. fired several specially designed GBU-28 bunker-busting bombs (nicknamed, “The Saddamizer”) at it, along with nearly two dozen cruise missiles, with no major effect on the bunker itself (though the building above it was demolished and there was some minor damage.) The bunker was also designed to be able to withstand chemical and biological weapon attacks, could house about 250 people, and cost about $66 million (about $183 million today) to design and build (built by the German firm Boswau and Knauer). Despite the cost, Saddam only used the bunker about eight times before being removed from power. Quick Fact 845: The United States has been in debt every year in its history except very briefly for about a year around 1835 when the colorful Andrew Jackson was President. 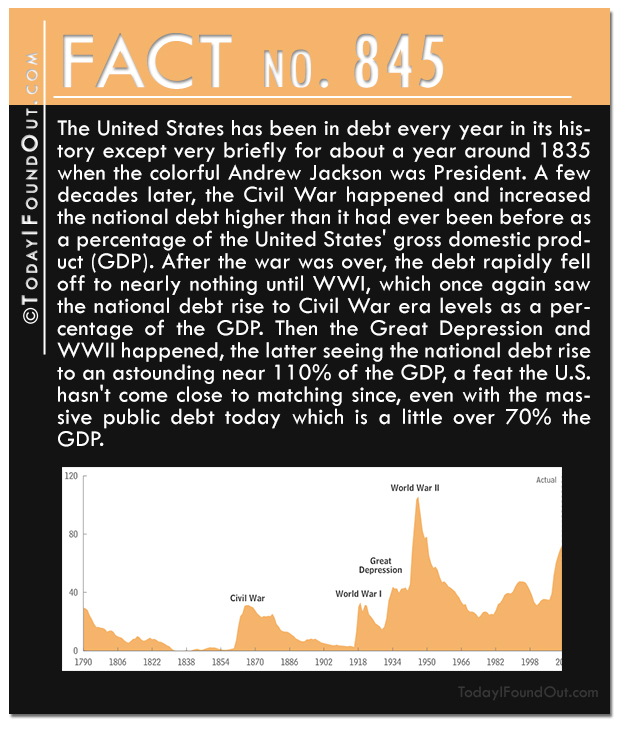 A few decades later, the Civil War happened and increased the national debt higher than it had ever been before as a percentage of the United States’ gross domestic product (GDP). After the war was over, the debt rapidly fell off to nearly nothing until WWI, which once again saw the national debt rise to Civil War era levels as a percentage of the GDP. Then the Great Depression and WWII happened, the latter seeing the national debt rise to an astounding near 110% of the GDP, a feat the U.S. hasn’t come close to matching since, even with the massive public debt today which is a little over 70% the GDP. 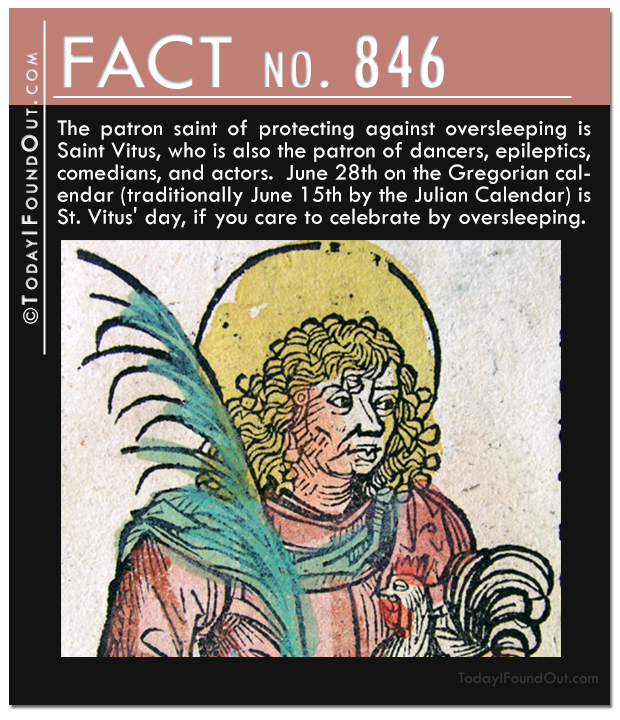 Quick Fact 846: The patron saint of protecting against oversleeping is Saint Vitus, who is also the patron of dancers, epileptics, comedians, and actors. June 28th on the Gregorian calendar (traditionally June 15th by the Julian Calendar) is St. Vitus’ day, if you care to celebrate by oversleeping. 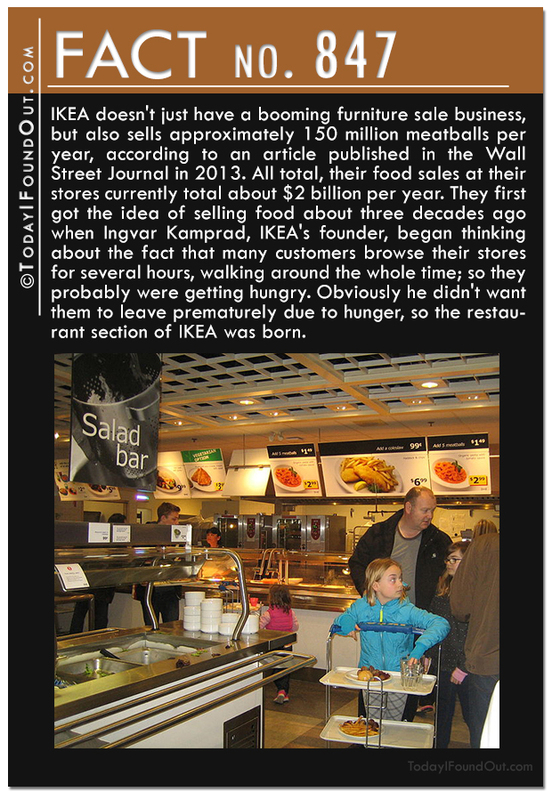 Quick Fact 847: IKEA doesn’t just have a booming furniture sale business, but also sells approximately 150 million meatballs per year, according to an article published in the Wall Street Journal in 2013. All total, their food sales at their stores currently total about $2 billion per year. They first got the idea of selling food about three decades ago when Ingvar Kamprad, IKEA’s founder, began thinking about the fact that many customers browse their stores for several hours, walking around the whole time; so they probably were getting hungry. Obviously he didn’t want them to leave prematurely due to hunger, so the restaurant section of IKEA was born. 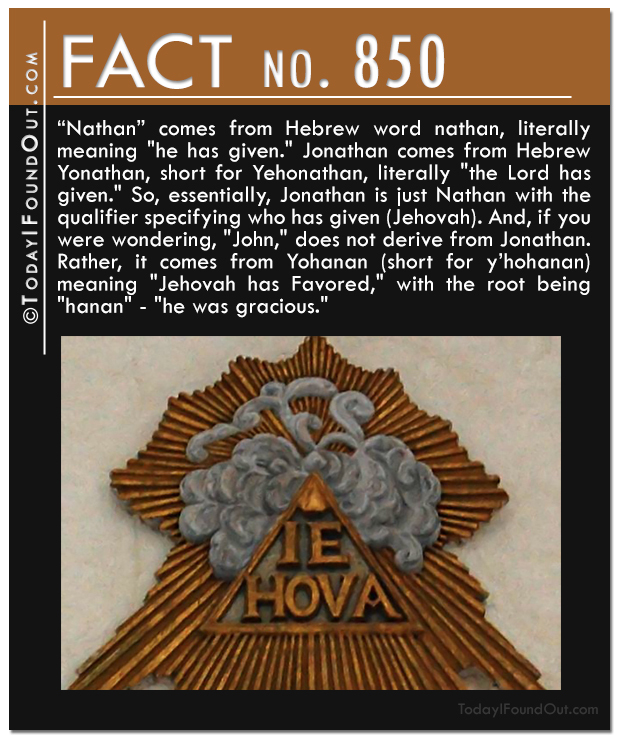 Quick Fact 849: From 1912 to 1948, art was an official Olympic event. 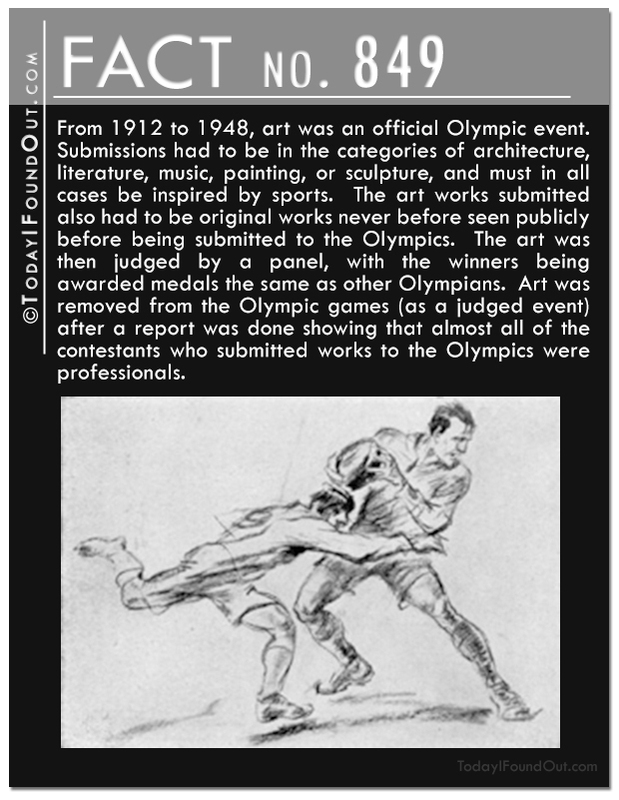 Submissions had to be in the categories of architecture, literature, music, painting, or sculpture, and must in all cases be inspired by sports. The art works submitted also had to be original works never before seen publicly before being submitted to the Olympics. The art was then judged by a panel, with the winners being awarded medals the same as other Olympians. Art was removed from the Olympic games (as a judged event) after a report was done showing that almost all of the contestants who submitted works to the Olympics were professionals.